The Oxford Compact Tank Bag is nicely proportioned and should fit many different fuel tank shapes. It measures about 280mm (~11″) across and about 450mm (~13″) long prior to stuffing it to its 36 liter capacity. It sits only about 140mm (~5.5″) high when not expanded, which is relatively unobtrusive and should allow a good view of the bike’s instruments. Tank bags are all about pockets, and pockets use zippers. Tiny zipper pulls can be frustrating and are all too common, so Oxford’s use of oversized zipper pulls on all of their luggage should be commended. Two types of zipper pulls are used, either a big metal ring or a hand-sized length of fabric. The metal rings are 30mm (1-1/8″) in diameter (see photo left), while the fabric pulls are a 70mm (~2-3/4″) long extension sewn on to the existing zipper pull, for a total of 95mm (3-3/4″). The metal rings have a nice brushed finish with the “Oxford” logo discreetly stamped on their surface, and all of the zipper sliders are also made from metal and have a matching brushed finish. The bag has a clear vinyl map pocket on top which opens from the rear (towards the rider). The top location of the map pocket’s zipper allows quick access to a map or directions that are stored there. The shape of the bag is a bit wider towards the rear, so the map pocket is slightly wider where it opens, making it easier to insert a map, which is not always the case with some tank bag designs. The map pocket is about 150mm (~6″) wide by 300mm (~12″) long, but the rear 60mm or so are covered by an opaque piece of vinyl. Nevertheless, the visible portion of the window is just about the right size for fitting a standard folded street map. The inside of the lid includes a full-length mesh pocket and two pen holders. The Compact Tank Bag has two outer pockets, one on each side. The top zippers on these pockets open up to reveal a space that’s about 255mm long (~10″) by 55mm (~2″) wide and 90mm (~3-1/2″) deep. These pockets are handy for storing a sunglass case, cell phone or other odds and ends. I’ve found that there are even certain sized water or beverage bottles that will fit. The outer side panels of these pockets have an interesting patchwork of fabric shapes and colors, highlighted by 3M Scotchlite reflective piping, that give the tank bag its unique style and define it as an Oxford product. The Compact Tank Bag also fits this ’99Triumph Thunderbird Sport. An expansion panel can be deployed to increase the overall bag height to about 215mm (~8.5″) at the rear (towards the rider). The interior of the Compact Tank Bag, like all Oxford luggage, is lined with a (claimed) waterproof PVC liner, in this case with an “Oxford” logo pattern, which is a subtle touch that lightens up the interior and gives it a nicely finished look. Each of the seams inside the tank bag are covered with a sewn vinyl tape, which also helps prevent any water intrusion and illustrates an attention to detail that comes from real-world experience. Oxford supplies a flexible stiffener board with the Tank Bag, which helps the bag keep its shape. It can be inserted into a special zippered pocket inside the walls of the Tank Bag. Inserting the stiffener into its pocket takes some doing, because it’s a very tight fit. You probably won’t believe it will fit when you first try it, but I’m here to tell you that it can be done (with a bit of patience)! Did I say it was a tight fit? The Compact Tank Bag also comes with 4 high-quality bungee cords that are 500mm (~20″) long before stretching. The bag includes 4 D-rings which are sewn to the outside of the bag, a pair to each side, located underneath the outer side pockets. The bungee cords can be hooked to the ends of these D-rings and then to a location on the bike to further secure the bag or to attach a small parcel on top of the bag if necessary. Oxford also includes a padded shoulder carrying strap that can be clipped to a separate pair of D-rings at the front, allowing the bag to be slung over the shoulder. A clear vinyl rain cover is also included for protection from heavy downpours and to help keep the bag dry if the bike is parked during a rainstorm. The Compact Tank Bag can be unzipped from its mounting base to access to a set of hidden padded shoulder straps. The shoulder straps are permanently attached to the bag, and they instantly convert the Compact Tank Bag into a rucksack, which is another nice feature. The designers didn’t stop there, because the exposed base also serves a dual purpose — it has it’s own map pocket, so it can be used independently of the tank bag. The designers should get kudos for their original thinking, because both of these features definitely add to the overall utility of the product. I’ve used the map pocket base by itself several times for some local trips when I needed to carry printed directions. Stuff in a map, throw the base on the tank, and away you go. The mounting base includes a built-in dual attachment system; magnetic and conventional. 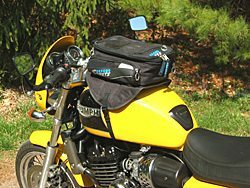 This is a good idea and comes under the category of “why didn’t I think of that?” The dual mounting system makes it easy to fit the bag on different motorcycles. Six 50mm (2″) magnets are located in separate pockets under the rubberized bottom for use on metal fuel tanks. The adjustable nylon webbed strap must also be threaded around the front of the bike’s headstock and attached to the front of the mounting base with its safety clip. There’s also an 800mm (~28″) long web strap that can be slipped under the fuel tank to secure the base on non-ferrous fuel tanks. The bottom of the mounting base is coated with a rubberized material (photo left), and Oxford also provides a sheet of rubberized mesh matting to help protect the bike’s finish. Any product that touches a motorcycle’s painted surface will eventually cause some scratching or blemishes during the course of normal riding, so you may also want to consider installing some 3M Scotchcal clear vinyl over the fuel tank for added protection. The bag and its mounting assembly must be completely lifted off the tank during fuel stops, which can be a bit difficult if the bag is filled to capacity. It’s not that hard to remove it when using the magnets only; simply grab the two flaps and lift it forward. Depending upon how full and/or heavy the load in the bag, it may be easier to unclip the front strap and remove the entire assembly when refueling. 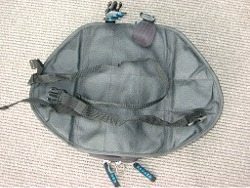 Apparently, the Compact Tank Bag isn’t available with mounting bases that are specific to particular motorcycle models. 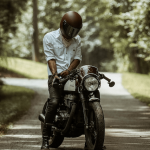 If the bike has a non-ferrous fuel tank, an additional strap is provided, which is placed under the fuel tank and clipped to the other side of the bag. Refueling is an unavoidable problem when using any tank bag, due to the nature of the design. Unless, that is, you’re riding something like the BMW F650GS, which has its fuel tank under the seat. Oxford also has an optional mounting base that can convert the tank bag to a tail bag and vice versa. Oxford provides a lifetime warranty (to the original owner) with all of their soft luggage products. The Compact Tank Bag is a well-made accessory that works for commuting, cruising and longer trips. It quickly converts from practical day-tripper to cross-country touring capacity. Once you get used to having storage for odds and ends like gloves, an insulated vest, a rain suit, toll booth pass or just a place to stow a jacket liner, it’s pretty hard to live without it.